CT30 and CT40. 3 metre track, Controlled Traffic Chaff Carts. After around two years of development, the new CT Cart was introduced in 2018 and is available for delivery during 2019. It features 3 metre track and 3.4 metres if CT is not a priority. Low oil requirement and light draft make it ideal for smaller and large headers. A simple fold down design allows multi unit transport for interstate deliveries, making a much more efficient freight cost. As from 2018 a new Touch Screen Controller is standard with all Carts. Simple to operate with minimal operator input, it has features such as: Programmable Auto Dump on Full. Ability to easily control heap height, on screen graphics and audible alerts to inform of any changes in status. Intuitive user interface with concise on screen explanatory notes for every function. Standard on all carts, Smartcart or CT.
Auto dumping on GPS way-lines is possible. Note. This function requires suitable software on a device with paddock mapping feature and an interface to signal the Controller. Please give us a call to discuss. Continued research and development is our focus at Tecfarm, so 2017 carts have small but useful changes to chassis length, front belt carriage and front belt length. This means greater clearance for extra long header augers, tighter turn capability, with less potential for damage if turned too tight and easy belt fold for transport. OLED display – Tecfarm uses OLED (Organic Light Emitting Diode) technology on the controller display. This technology uses individual LED’s for each pixel, which results in a bright, higher contrast display. Shaft speed sensor – The controller hardware and firmware was updated at the end of 2014 to include the capability to monitor shaft speed for the belt. 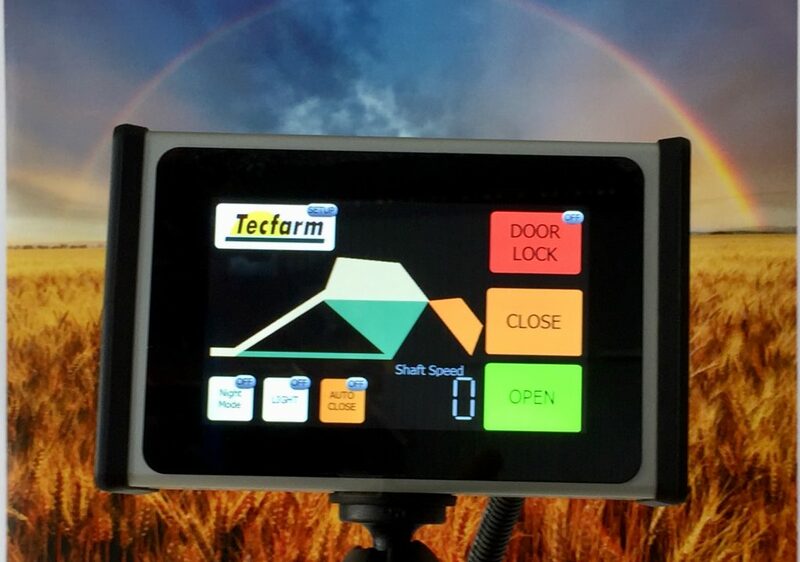 From 2016 all Tecfarm controllers also have the capability to alert the operator if the shaft drops below a programmable threshold. The Smartcart 40 Introduced with the same successful design as the Smartcarts 30 and 50 and complements the Tecfarm Chaff Cart range as a mid size alternative. The Smartcart 40 is a natural fit on farms that require larger capacity but may have limited road width and paddock size. At 5.35 metres overall, width is exactly midway between the 30 and 50 models with the same height and length. The Smartcart 40 is available for delivery during mid 2016 in good time for harvest. Hitch extension – An optional bolt on extension to the cart chassis and lower conveyor. Used in situations where very long harvester augers are too close to the cart. Available anytime, as an after market kit. Longer chassis and conveyor to better suit long augers on some harvesters, with extra bolt on extension available. Fully adjustable conveyor cover to help regulate material entry into cart. Available anytime as a retrofittable option. Smartcart 50, now in its fifth season is an option for farms with more open areas, allowing much less management of dumps. New longer chassis length introduced for 2017 allows for tighter turns. Revised front conveyor carriage mean less potential for damage if oversteered on corners. Note: Fitting of collars on steering rams is highly recommended. A new CTF cart for 2018 season. 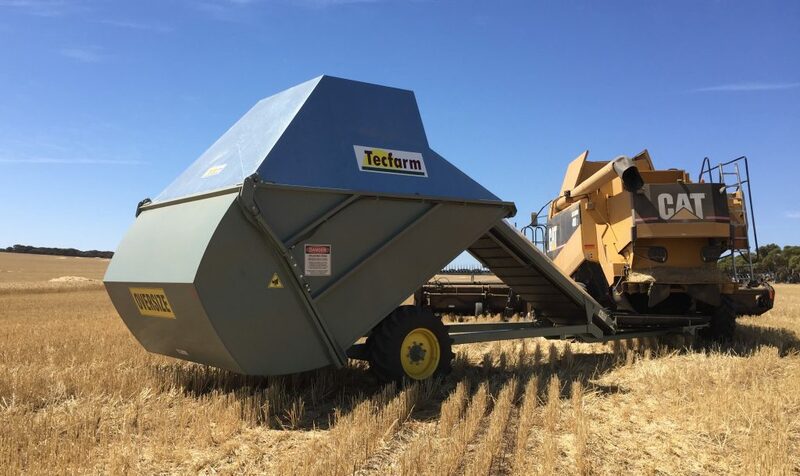 Tecfarm is committed to providing the best chaff carts available to the Australian grains industry. We constantly assess every aspect of our designs to maintain this position and enhance features where practical. The Controlled Traffic Cart on 3 metre track (capable of very economical multi unit transport interstate) has been a major part of our focus.